I love it when two visual moods come together in one image. 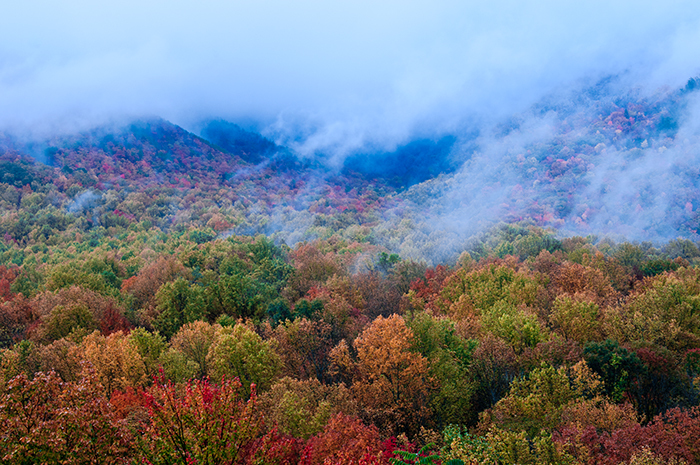 In Shrouded Autumn, peak fall colors are enveloped by the low-lying clouds from a clearing storm. Either mood, the warm colors of the season or the cool tones of the storm, could stand on their own in making a pleasing image. Combining the two, however, really added a contrast and a drama that my eye naturally responded to. Moments like these are exciting to us photographer- types, mainly because they are rare and because the living the 'f/8 and be there' mantra pays off! Autumn and Winter is another example in this Smoky Mountain Gallery showcasing two dynamics combining to create a timeless moment.